In the 1960s, when humankind first landed on the Moon, just getting there and back safely was enough. NASA's plans for a return to the Moon in the coming decades of this century have a more ambitious goal: to establish a permanent base on the lunar surface. On this base, scientists will live and work, and perhaps prepare for travels to even more distant worlds like Mars. The first lunar colonists will face many challenges, among them finding ways to land spacecraft and build habitats. The Lunar Reconnaissance Orbiter (LRO) will function as a scout sent ahead of the human explorers who ultimately will build and inhabit the Moon base. The orbiter has two main goals. 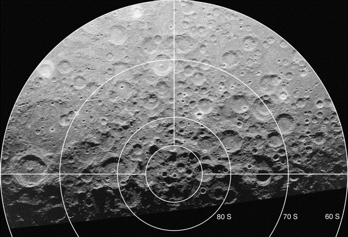 First, using its variety of instruments (including LAMP), it must obtain data that can be used to make high-resolution images of the surface of the permanently shadowed polar regions (the Moon's south pole is shown above, courtesy of B. Campbell). Second, it must identify, quantify and map what might be deposits of ice water near the surface in these cold polar areas. Most of us think of the Moon as a dry, dusty place. But for a long time there has been speculation that there is in fact water ice, especially at the cold, shadowy poles. One theory suggests that comets and asteroids, which bombarded the solar system during a period about 3.9 billion years ago and may have been responsible for bringing water to Earth, also deposited water on the Moon. Most of this would have evaporated due to the Moon's low gravity, but some might remain. Craters on the Moon are evidence of these impacts. Two prior NASA missions sought to confirm the existence of water on the Moon. In 1994, the SDI-NASA Clementine spacecraft, in orbit around the Moon, sent radio signals into dark polar craters and found evidence of possible ice there. Four years later, the Lunar Prospector found similar, but still inconclusive, evidence for water. NASA scientists even crashed Prospector onto the Moon's surface in an attempt to generate a cloud of dust and water ice, but no such cloud was detected. Finding out conclusively whether there really is water ice on the Moon is one of LRO's major objectives. If the answer is yes, it will be much easier to establish the planned lunar base. Water can be used not only for human and plant consumption but also to make air, rocket fuel and a shield against dangerous space radiation. In addition to LAMP's ulraviolet-sensing technology (see the Science and the Instrument page for a detailed explanation of that), several of the other instruments aboard LRO will be aiding the search for water. The Lunar Orbiter Laser Altimeter (LOLA) will measure the brightness of the reflections of laser beams it shoots toward the Moon. If the surface has ice, the reflections will be brighter. Another instrument, Diviner, will check to see which parts of the lunar surface are really cold enough to prevent evaporation. The Lunar Exploration Neutron Detector (LEND) will count neutrons being emitted by the lunar surface. Because water absorbs neutrons, a drop in their count from any area on the Moon could indicate the presence of water. Working together, the instruments may finally be able to answer, for good and all, the question of whether and how much water exists on the Moon. 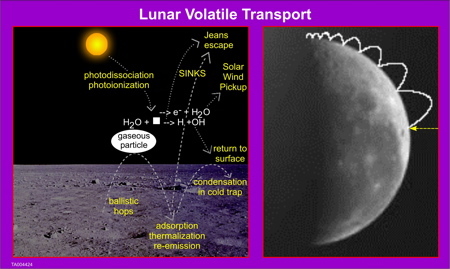 LAMP continues to study how water and other volatiles are formed, transported through the lunar atmosphere, and deposited on surfaces. LAMP is mapping out and searching for exposed water ice in permanently shaded regions (PSRs) using an innovative illumination technique and a far-UV spectral “fingerprint”. LAMP far-UV maps are diagnostic of space weathering with many new features. LAMP-observed reddening at longer FUV wavelengths suggests 1-2% surface water frost in several PSRs. LAMP also remotely senses the global helium exosphere, molecular hydrogen, its variability, and sets new upper limits to numerous expected constituents.